Morpheme Remedies Garcinia 5X is an efficacious combination of 5 natural ingredients, each contributing to an effective and easier weight management plan. 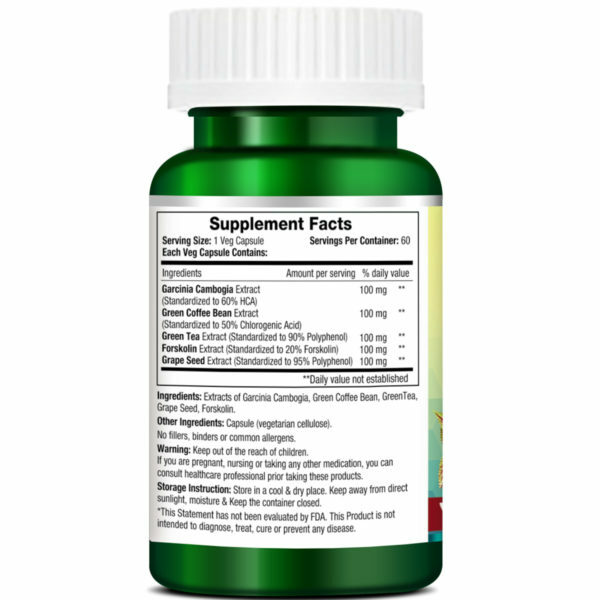 Garcinia Cambogia, Green Coffee, Green Tea, Forskolin and Grape Seed, all work together to support metabolism, suppress hunger and help improve the burning of extra fat. Combined in a single capsule, this product makes the arduous task of weight management seem simple. Also, this product is 100% vegetarian and does not contain binders, fillers or common allergens. The demand of the day today is staying in good health with your weight under control. There are all kinds of fad diets, exercise routines, wonderful foods and what not, each promoting itself as an answer to all your weight problems. Though the claims made by all are very promising, few deliver what they claim. But it is not all that difficult as it may seem. A balanced approach to weight management is the answer and an end to all the weight-related woes. An intelligent diet plan, an achievable exercise routine, and an effective supplement can deliver the most astounding results. Morpheme Remedies Garcinia 5X is one such genuine product that is known to show positive results and can help you in keeping your weight in check. Backed by extensive research programs, all Morpheme Remedies products are a popular choice amongst weight management aficionados. Free from binders and common allergens. The Morpheme Remedies Garcinia 5X veg capsules contain 5 vital ingredients that are known to help in achieving weight management goals. Each of the ingredients is natural and is not known to cause any side effect. Garcinia Cambogia also known as Malabar Tamarind is seeing a great demand in recent years as a weight loss supplement. It is popular due to its ability to restrain the body from making fat and suppressing your appetite. Hydroxycitric acid (HCA) present in its rind is responsible for decreasing fat synthesis and reducing appetite by increasing satiety . Green Coffee beans are nothing but unroasted coffee beans. Roasting of the coffee beans makes them lose a very important chemical – the chlorogenic acid. This acid is known to have multitude of health benefits, one of them being improving the metabolism and supporting weight loss . Green Tea is loaded with antioxidants and has a host of other health benefits too. The compounds in green tea have powerful effects on the metabolism and could help promote fat breakdown and boost fat burning . The root of a plant from the mint family is used to make forskolin . Forskolin acts on the enzymes which promote break down of stored fats and increase their utilization; thereby it helps in mitigating weight gain . Grape Seed extract is extorted from the seeds of red wine grapes. Grape Seed extract is rich in antioxidants that are known to have a number of positive effects on health. .
My fitness instructor advised me to take a garcinia supplement. The ingredients list of Garcinia 5X evoked my interest in this product. It provides more than just a sole garcinia supplement. It has helped in boosting my energy level and has reducing my cravings. A fantastic product. I am taking it for the last two months and it has helped me lose weight. I never felt more energetic before taking this supplement. This is a wonderful weight loss product. It helped in suppressing my appetite without causing any harmful side effect. I feel more energetic and I am burning fats at a faster speed. I believe this is one of the best dietary supplements available in the market. It helped me conquer my cravings for unhealthy food. After seeing the weight scale showing by body weight falling, I am happy that I chose the right product. Garcinia 5X has helped in reducing my hunger. After I started taking this supplement I hardly feel the desire to overeat. It has also helped in reducing fatigue. Garcinia 5X helped in reducing my cravings for unhealthy food. It helped in making me feel full fast. It increased my energy and helped in burning fats. It has helped in increasing energy and reducing hunger. After taking this product for a month, it has helped me in losing some weight. Helped in providing that extra boost in energy I needed to lose weight. Its appetite suppressing effect helped me in following a healthy diet. Feeling a bit energetic after taking this product for a week. Yet to see whether it helps in burning fats. This product is helping me in losing weight without any adverse effect. It has helped in decreasing hunger, increasing satiety and boosting metabolism. Getting rid of the excess body fat was not easy for me. I was struggling with hunger pains and fatigue. A friend who had benefited by taking Garcinia 5X recommended me this product. It has helped in reducing my hunger and increasing my energy level. I am extremely impressed with the result. I can now diet and exercise and lose weight. This is a helpful product. But it only works when you diet and exercise. It does help in increasing energy. With garcinica and other four natural anti-obesity plant extracts packed in a single supplement, this is a hassle-free way of enjoying the benefits of multiple products. It is helping in curbing appetite, boosting fat burning and increasing energy level. This product seems to help in boosting metabolism. After I started taking this supplement, I am losing weight at a faster rate. It has given my weight loss routine that includes diet + workout, the boost to stay on track. This supplement has combined natural ingredients that are known for their anti-obesity effect. After taking it for a month, I found that it works. It has helped in improving the effectiveness of my weight loss diet and exercises. This is an amazing supplement for weight management. It supports the body’s weight loss mechanism by controlling appetite and improving metabolism. This supplement assists weight management. However, you can only expect result if you exercise. It has helped in boosting my energy level so that I can follow my workout schedule. I am taking this product for two weeks. It has helped in reducing hunger. My energy level is slightly higher. By including several ingredients that are known to assist in weight loss, this product is quite effective. I am satisfied with the result. This product is ideal for that extra boost that anyone needs to stay on the weight manage track. It helped in reducing cravings for unhealthy foods and supported metabolism. This product helped in speeding up weight management. Its effect on my appetite and metabolism has helped in losing weight. This supplement helps in weight Management. It has helped in energizing me. I am losing weight fast, which I believe is due to its metabolism boosting effect. After taking this supplement, I am feeling less hungry. My natural energy is now higher than before. I’m losing fats by dieting and with workouts. Dieting is no longer painful for me after I started taking this supplement. It helped restore normal appetite. My satiety level is now higher. So I now eat less but do not feel hungry. I lost some fat and expecting to lose more. 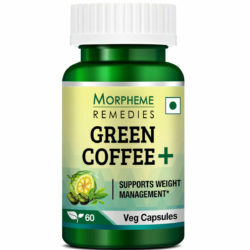 With garcinia, forskolin, green coffee and other ingredients combined in a single supplement, this is an excellent product for healthy weight management. It has helped me in controlling hunger and supported speedy weight manage. I am taking it for 3 months. It gives the benefits of several supplements. It has helped in suppressing hunger and bolstered metabolism and, as a result of it, weight management. I am impressed with this supplement. It helped in putting a brake on my appetite. There is no side effect. I am losing weight and feeling great. This supplement has helped reduce overeating. My satiety level is now higher. I am exercising and burning fats fast. I am on this supplement for 3 months. Garcinia 5X has been useful for me in controlling appetite and speeding up weight loss. The garcinia supplement helped in making me eat less. It has worked as an excellent metabolism booster, increasing my energy level and speeding up weight loss. This is a good supplement. It is helping me in losing weight. I feel less hungry, my energy level is higher. This product has helped in reducing my hunger and increased my energy level. I am burning fats faster after taking it. Controlling appetite has become easy after I started taking this product. It has helped in improving my health and stamina. It is supporting faster weight loss. Garcinia 5X is a good quality product. It helped in easing weight loss by controlling appetite and increasing metabolism. This is a safe appetite suppressant. It helped boost metabolism. It has given me energy to do workouts. I’m losing weight and feeling great. The garcinia supplement is supporting faster weight loss. It helped curb appetite and relieved overeating. It metabolism and energy boosting effects are helping in burning fats. This is a good energy booster and appetite suppressant. These two effects of this product is helping me in getting rid of the excess body fats. This supplement with garcinia and other herbs is helping me in losing weight. It is a good appetite suppressant and is supporting metabolism. This product has been quite effective in controlling hunger. It helped suppress appetite without causing any side effect. It has also helped in improving digestion. Its energy boosting effect is helping me in working out. This supplement has helped in killing excess hunger. Now I feel satisfied after consuming smaller portions, enough to meet my energy need. It also helped in getting rid of the excess fats. This is a natural product and a safe supplement for weight loss. It has helped reign in overeating. It has been good for my health. I’m feeling energetic and burning fats. This is a good product for controlling appetite. It has helped in reducing my cravings for sweets. My energy level is higher and metabolic rate seems to have increased as I am experiencing faster weight loss. The supplement has helped in relieving excess hunger. It helped improve digestion and increased energy level. I am really happy with this product. It helped in addressing the two problems I was experiencing ….excess hunger and low energy level. Now I am losing weight fast. This is a useful product for healthy weight loss. It helped reduce hunger and improved energy level. I can now work harder in the gym and lose fats fast. This is a very useful product for losing weight fast without any side effect. It boosts the effectiveness of a diet and workout regimen for weight loss by suppressing appetite and stimulating fat burning. This supplement has been effective in suppressing excess hunger. It helped boost energy and I’m burning fats faster by exercising longer. This is potent fat burner. It helped curb hunger without making me weak. I feel energetic and can exercise longer. This product is helping me immensely in losing weight. Its appetite suppressing effect is helping me in dieting. My health has improved and I can exercise longer. Getting rid of the fats initially was not easy for me. Garcinia 5X helped kick start the process. It helped boost energy production so that I can exercise without feeling tired. It even helped suppress excess hunger. Feeling stronger and energetic after taking this product. It helped in suppressing excess hunger. It is helping me work harder in the gym and burn fats fast. This product is supporting weight loss. It helped reduce excess hunger, increased energy and stimulated fat burning. With exercise, diet and this supplement I am losing weight fast. This is a very useful supplement for weight loss. It helped in giving me relief from hunger pangs. It is an effective metabolism booster. I feel energized and workout fatigue has reduced. I found this supplement quite effective in controlling appetite. It helped boost energy and stamina for workouts. This is an effective and safe appetite suppressant. Within a few days I could feel its effect. It is of great help for dieting. I feel energetic and rejuvenated. This product helped boost the effect of diet and exercise for weight loss. It helps curb hunger. Exercise fatigue has lessened after I started taking this product. This is really an amazing product. It helped speed up weight loss by suppressing hunger and increasing energy for workouts. Excellent product for suppressing excess hunger. It helped boost energy and improved health. With the help of this product I can now diet, exercise harder and burn fats fast. This is quite effective in reducing cravings. It helped me feel full fast. My energy level has increased. Am steadily losing weight. This is good for suppressing hunger. An excellent natural product for reducing urge to overeat. It is rich in natural antioxidants. My energy level has increased. This is supporting weight loss. This product helped reduce cravings. This is a safe product for suppressing appetite. It seems to be a good energy booster. A helpful product for reaching the weight loss goal. This is good for suppressing appetite without side effect. I also feel it has helped boost energy level. A useful product for meeting weight loss goal. This is a good appetite suppressant. It also works as an energy booster. It helped speed up weight loss. This is indeed an excellent weight loss supplement. The appetite suppressant is helping me in dieting. It is also working as an energy booster. At the initial stage, when getting rid of the fats that had accumulated in the body for years is difficult, this product helped stimulate weight loss. It works as an appetite suppressant and energy booster that are helping me in dieting and exercising. This product is a blend of natural ingredients that support weight loss and metabolism. I am on this for 2 months. It is a good appetite suppressant. My energy level is higher and I can exercise longer. This is good for suppressing appetite. I eat less and do not feel too hungry. This has not affected my energy level. I feel healthier and can exercise harder. I feel energetic and am burning fats a little faster by exercising harder. I also found this helpful for reducing appetite. This supplement helped restart weight loss after hitting plateau. Can exercise harder and am eating less. This product has been very effective in curbing appetite. I do not overeat after I started taking this supplement. Helped in improving metabolism. I feel energetic. This has helped me in controlling appetite. Feeling healthier and energized. Exercising and dieting have become easier. This is good for reducing hunger. Helping me in consuming less food. Helped boost energy and exercising capacity. Garcinia 5X works well as an appetite suppressant. It makes me energetic. A good weight loss supplement. This product is helping in burning fats. I no longer overeat and feel full fast. This is a good appetite suppressant. It also appears to be a good fat burner. Helped boost my energy level. After I started taking this product I feel less hungry. It has helped in making me energetic. Supports metabolism. A helpful product for losing weight. An effective appetite suppressant. Now I feel satiated fast and do not overeat. It is good for overall health. I feel energized for workouts. An effective appetite suppressant. It helped me in reducing calorie intake without feeling hungry too often. My energy level is higher and can exercise for a longer time. A good appetite suppressant. This is a safe supplement. My energy level has increased after taking this product. After I started taking this product I feel less hungry. There was no side effect. I feel healthier and more energetic. Eating less, exercising harder and losing weight. Consuming 1 capsule before meals is known to show positive results. You can consume the capsules 1-2 times daily or as directed by your healthcare professional.